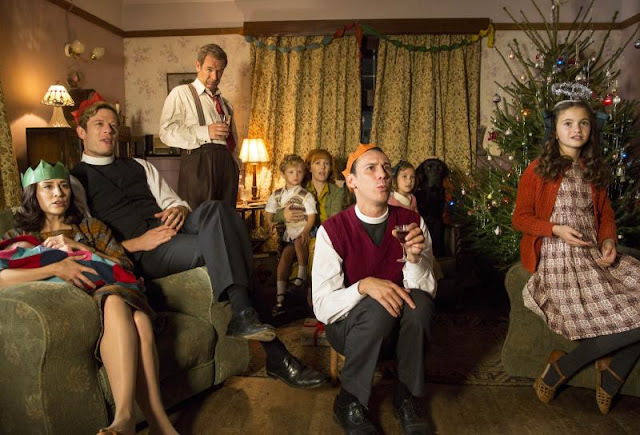 Grantchester came back last week, opening the new season with a Christmas episode. A Christmas episode in June. I still don't know why and as much as the marketing pieces tried to play up the whole magic of the season bit, it was hard to get into the spirit of Christmas with summer blazing away outside. That is, until the end of the program when everyone came together for Christmas dinner and even sour faced Mrs. Maguire got into the holiday spirit, actually smiling at Amanda. A huge concession considering Amanda is now the divorced mother of a newborn, in love with the reverend Sydney, the minister Mrs. Maguire mothers and keeps house for. I smiled too, in recognition of the tissue paper crowns everyone is wearing although they didn't show the actual pulling of the Christmas crackers, or the telling of the usually awful punny jokes hidden inside the crackers. There's also a silly prize. After dinner, like good Brits, they played a game of charades, another English holiday tradition I love. I'm very familiar with the mystified expressions on their faces—that happens to me when I'm the one giving the clues. This is my family—I'm the out of focus one on the right—about 20 odd years ago. I'm horrified by the sight of the soda cans sitting on our Christmas table! I can't remember any of us being that slackadoodle! Where are the glasses??? That little boy on the left, my pride and joy, is 24 now. 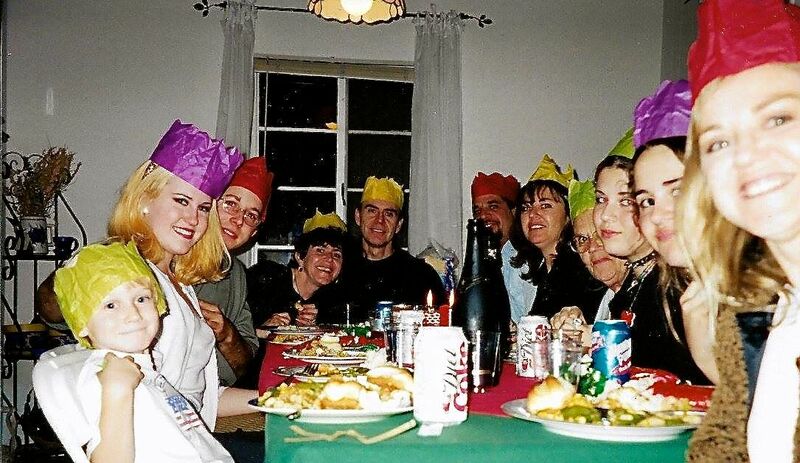 dinner are two of the English Christmas traditions I grew up with and that my brother (middle of the picture, yellow crown), sister (second from back, on the right, yellow crown) and I still cherish. That appreciation of our British roots is evident even today in the bumper sticker I saw on my now-grown-up niece's car "Made in the USA with British parts." I can't tell you how happy it made me to see that! 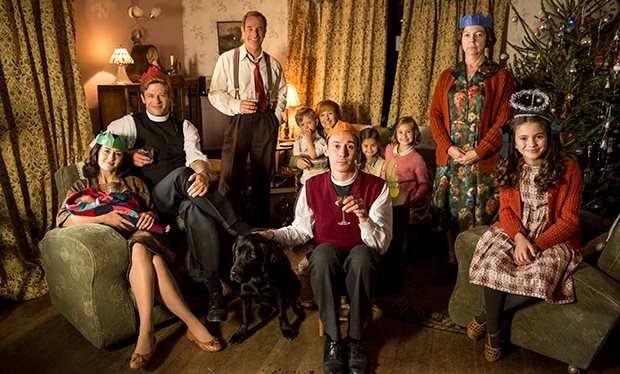 I still don't know why this season's Grantchester began at Christmas time, but I do love the memory jog back to my own family's traditions. And James Norton. As my mum might have said, pulling out her best Londoner 'he's a bit of a alright, he is'. And he is. 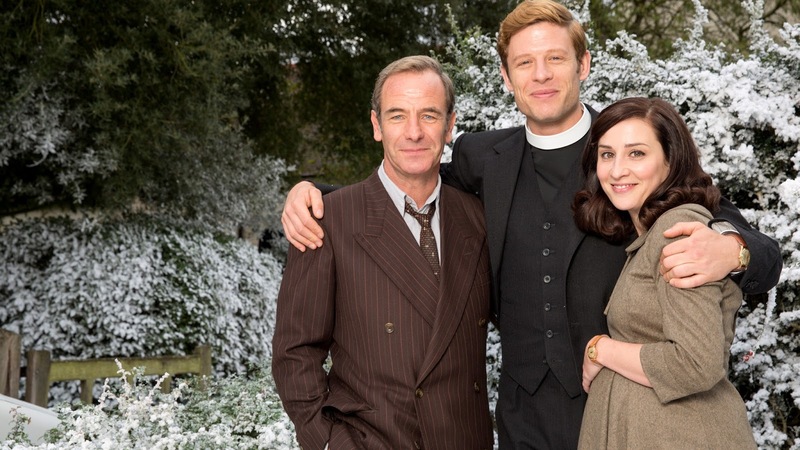 Grantchester, based on a series of books by James Runcie, airs on Sunday nights on Masterpiece Theater here in the U.S. I've yet to catch up on this week's episode. Any other British telly addicts watching Grantchester too?